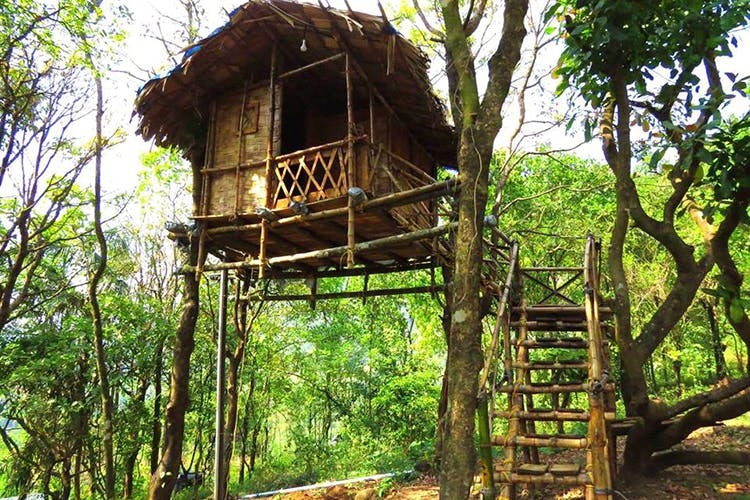 Located in heart of the hills, this eco-tourism resort has rooms that are perched on a tree house amidst the floating clouds. Situated in Kannur district, Regina Silva is located amidst the mountain ranges of Western Ghats. Unspoilt nature and misty mountains beckon at this camping resort, where you can admire the views from your tree house. Located by an Ayurvedic ashram, you also have the choice of catching up on your beauty rituals in the fresh mountain air. The resort is in the middle of wildlife territory where elephants, leopards and deers have been spotted, so make sure you have your binoculars handy. Trekkers and hikers will rejoice with the number of treks to choose from leading to waterfalls and more. In the heart of mother nature, the tree houses can be accessed by little staircases that give you a bird’s eye view of the forests. It’s a common sight for the clouds to pass you by, as the property is located in Paithalmala, the second highest peak in the Western Ghats. If this makes you feel a bit dizzy, you can also opt to stay in huts located across the property. Your room stay comes with complimentary breakfast — take your pick from Indian and continental. The menu offers a simple selection along with a lunch and dinner buffet, with a la carte options as well. If weather permits, you are invited to a bonfire dinner where the team will serve you speciality dishes from Kerala. Choose from chicken curry, masala fish, appams, rice dishes and more. Whether you want to take it easy and treat yourself to an Ayurvedic spa, or trek into the forests to watch the sunset — Regina Silva has an activity for every type of traveller. At the Ayurvedic centre, pamper yourself with detoxification treatments such as oil massages, mud therapies and steam baths. For the adventure trekker, the team can organise several guided treks to various lookout points and scenic locations in the interiors of the forest. For those looking to soak in a bit of culture, the team also arranges sightseeing trips to nearby villages and rubber plantations. Visit a coconut oil extraction mill, watch wild elephants or even drive down to Kannur where a plethora of activities await.